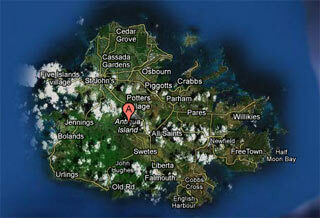 Google satellite image of Antigua. Against the background of the global economic crisis, the International Monetary Fund (IMF) has approved a $117.8 million loan to support the Antigua and Barbuda’s plan to recover from mounting government debt, weak economic growth, and the effects of the economic crisis. Policy reforms to mitigate risks in the financial sector. With the plan in place, the IMF predicts growth in Antigua and Barbuda will resume in 2011 after a contraction of 7 percent in 2009, and will pick up to about 4 percent by 2015. Antigua and Barbuda’s economy was devastated by the global economic crisis. In addition, the country’s large debt burden has magnified the fallout from the recession by limiting the government’s options to implement policies to cushion the blow from the crisis. Sharp falls in tourism of 13 percent, and tourism-related foreign direct investment, and a decline in the amount of funds sent home by Antiguan and Barbudans living abroad, have led to a contraction in the economy. At the same time, with limited financing options, the government has had to raise taxes to offset falling revenues. Economic reforms are needed to put the public finances on sound footing, and establish the basis for sustained strong economic growth. Antigua and Barbuda’s economic program demonstrates its commitment to meeting these challenges. The government plan includes a restructuring of domestic debt owed mainly to the social security scheme, and the country’s external creditors will also participate in Antigua and Barbuda’s return to sustainable debt levels. • Public financial management reforms: to prioritize public spending and investments. Part of the authorities’ plan includes measures to strengthen the domestic banking system, which suffered in the wake of the collapse of the Stanford International Bank. All these initiatives are designed to maintain a solid and stable banking system for Antigua and Barbuda.